Metal detecting in Indiana can be lot's of fun. However, it's important that you understand the ARPA (Archeological Resources Preservation Act) Law. The ARPA law is lengthy, and confusing. It was first written to protect Indian lands, especially Indian burial grounds from looters in the West. However, over the years the law has been amended to include many Federal properties in every State. The law is quite extensive. I have included on this page as well as throughout my website enough information that will help you to grasp the far reaching scope of the ARPA law. ARPA (Archeological Resources Preservation Act). "The National Historic Preservation Act (NHPA) was enacted in 1966 to protect the Nation’s historical resources from increasing development and expansion pressures by establishing a comprehensive national historic preservation policy. It defines historic properties to encompass a broad interpretation of American history and acknowledges significance at all levels, not just nationally. Furthermore, historic properties are now understood and appreciated as part of—not isolated from—the landscape in which they belong. Implementation of this act is mainly through 36 Code of Federal Regulations (CFR) part 63, Determinations of Eligibility for Inclusion in the National Register of Historic Places, and 36 CFR part 800, Protection of Historic Properties. The regulations that implement the NHPA and their accompanying guidance documents formulate a proactive national policy on historic preservation. It specifically directs federal government agencies to take historic preservation into account in planning their initiatives and actions. Thus, the federal government is now a full partner and a leader in historic preservation." Visit my laws page for more information about the above laws. As confusing as the above laws may seem, do not dig anything that you believe is an artifact, or anything that is older than 100 years. Especially if you are on any State Lands. If you want to detect on private property, then be sure you get written permission from the landowner. Asking for permission to detect on private property just takes a bit of courage. You will have property owners say no, but if you are persistent and keep asking more people, eventually you will have a number of places to detect. For detecting in Indiana town, village and city parks, you'll need to check with those local officials. Detecting on public lands is not allowed. On beach areas only you need permission from the Park Manager. 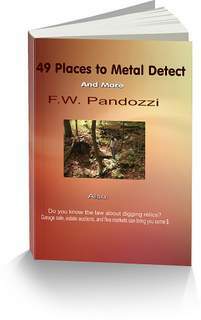 Do Not Let These Laws Stop You From Metal Detecting In Indiana. Have you tried metal detecting in Indiana ghost towns? Need a metal detector or accessories?